~ by Tammy on September 1, 2011. So beautiful a subject, love this. I appreciate very much the still life! Love the framing of this image. Very pretty! Love the colors on the jar and the shape. Have a great day! How much does a Grecian Urn? Looks like it would make a nice fountain. Nice piece! I love the delicate colour changes in the picture…you captured just the right amount. Wonderful photo of an arts and crafts pot! Has an HDR look about it. I picture it full of flowers! Awesome! I have a thing for “jars” like that! 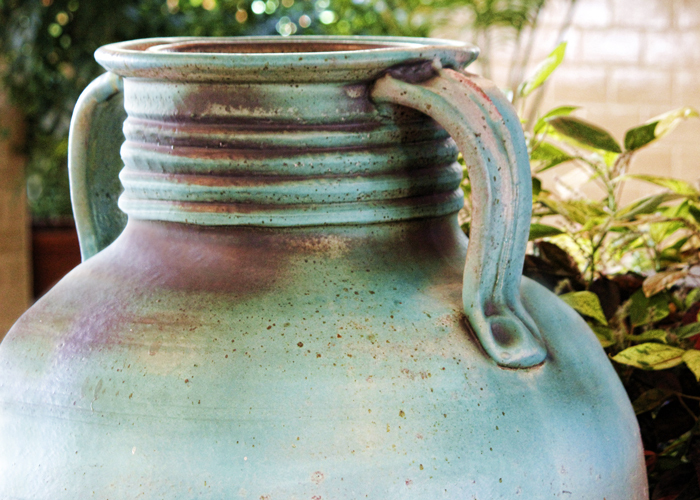 Love the urn with its gradation of colors and your photo for its crop. Love the simplicity and all those wonderful curves, beautiful composition Tammy!